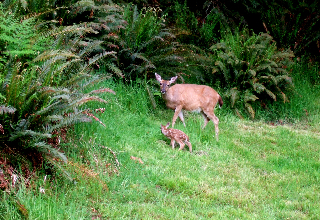 Doe mothers around the island are in the last stages of their pregnancy and will soon be giving birth to beautiful fawns. The GROWLS Article in the Flying Shingle this week is about this wonderful event. Fawns are so vulnerable and so innocent, we must do all we can to educate everyone to be aware of this wonderful event taking place in the natural world. Posters will be going up as a reminder to islanders and will appear in both papers in the next few weeks. Doe mothers are very protective of their babies, if you are called out to check on a fawn be sure you are always aware of where the mother is . Do not turn your back on a doe mother in this situation as she could charge with hooves flying and you could be injured!! !